At least for now… we’re not. Instead we’re going to open a whisky distillery in Patagonia. SAY WHAT?! At the end of last year my boyfriend and I left the coal mining town that we had called home for what seemed like way too many years in search of new experiences. We wanted to learn another language, see new places, climb mountains, experience living in another culture, meet different people and ultimately challenge ourselves to a much greater extent than we had been. We decided on Santiago, Chile, as our first destination for a number of reasons including that we could learn Spanish; it had a major international airport from which we could fly almost anywhere; it had a climate so varied that it was less than 2 hours from beaches in summer and ski slopes in winter; it was relatively safe; and it had the most number of industry contacts that we knew so we’d have the best chance of getting jobs. A month after arriving in Chile we ventured all the way down to Patagonia, Chile’s southernmost region, to explore its spectacular landscapes before the weather turned too bad for winter. Patagonia was INCREDIBLE. Glaciers that carved as you watched; lagoons full of pink flamingos; guanacos (lama relatives) staring at you as they munched on the vast grass plains; rugged and craggy glacier-covered mountain ranges that seemed to sprout up from nowhere; black and white dolphins jumping along the beaches; the bluest of blue glacial lakes against rolling green hills; geological features that you didn’t know could exist; huge soaring condors… and I haven’t even mentioned the giant sloth statue. But Patagonia’s most famous national park, Torres del Paine, was definitely the major highlight. 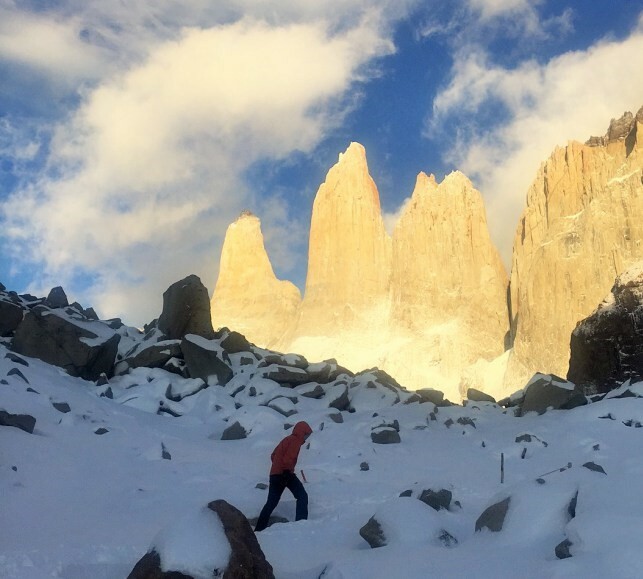 You can hike Torres del Paine a number of ways, but we did the classic W, west to east. We got extremely unlucky with the weather with unseasonably continuous snow and rain, so bad that they closed parts of the circuit. We did however enjoy a fabulously clear day when we finally reached the towers that the park is named after, and we were able to complete the hike one day earlier than planned. We returned to Puerto Natales, the small town from which hikes of Torres del Paine are based, for an extra day before we could leave for Argentina. We were strolling around the streets searching for somewhere warm and inviting to spend the late afternoon. We’d been to the vegetarian café twice, the lovely pizza place twice and the microbrewery twice, and but what we really wanted was a cosy bar that had comfy chairs and served quality drinks. 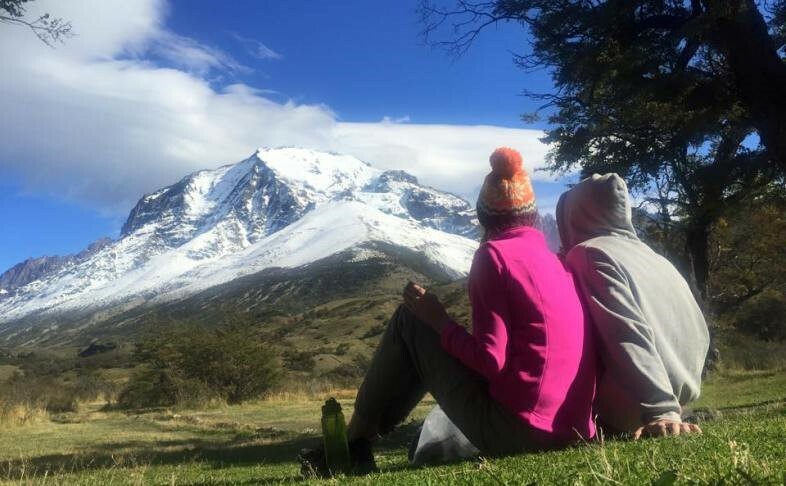 We spent the remainder of our time in Patagonia, during our long bus journeys, hikes, glacier gazing and beer appreciating sessions, day-dreaming about the possibility of doing it ourselves. It just seemed to make so much sense. All over Chile, and especially in Patagonia, there is lots of great locally-made beer (and hence malted barley and fermenting equipment), copper pot stills are already in use in Chile to make Pisco, and there are even peat bogs in Patagonia. Tourists who visit Patagonia require sufficient disposable income just to get there, and you can’t visit Torres del Paine without spending at least a few nights in Puerto Natales. On top of this we’d be working for ourselves, living in one of the world’s most stunning locations, and once we were set up we could work seasonally, in line with the tourist seasons. Back in Santiago, we haven’t been able to bring ourselves to contact any of the industry contacts we have, for fear of them offering us a job. Instead we’ve gleefully dived head-first into studying whisky, investigating foreign entrepreneurship in Chile and creating a realistic business plan. So, we’ve left coal in pursuit of peat bogs and whisky! (which is rather poetic if you’re a bit of a geology nerd, we’re doing the reverse of the coal-making process). I’ve created this blog to record and share our crazy adventure. Any comments, advice, recommendations, questions or exclamations are more than welcome!